BBC Radio 4 will be returning to the world of Neil Gaiman’s Neverwhere on this coming Friday afternoon. The Drama presentation for November 4 is a Dirk Maggs production of How The Marquis Got His Coat Back. 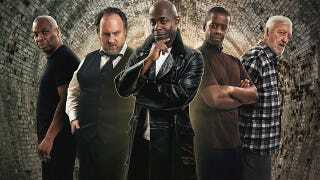 Paterson Joseph who played The Marquis in the original television version of Neverwhere gets to reprise his role. Bernard Cribbins returns as Old Bailey and Don Warrington plays The Shepherd. There is also a cameo from James McAvoy and Adrian Lester plays Perrigrine. As usual, the production will be available online soon after broadcast and a cd release is also on the way.